It’s a good thing that Vajrang did have a look. The “raw data” file size on average was around 5% less in size than the “size on disc” for all but one! It appears that my methodology was pretty good but not perfect. It hasn’t had a big effect on the observations between Features V Sketches BUT I have corrected and updated below and I have apologised to Sketch Fillets. So what about the PLUS he mentioned! 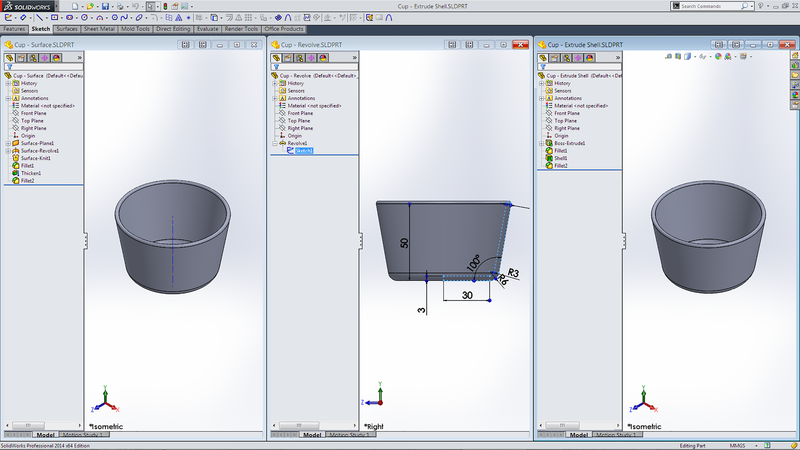 If you think the SolidWorks Development team isn’t putting in the effort THINK AGAIN! 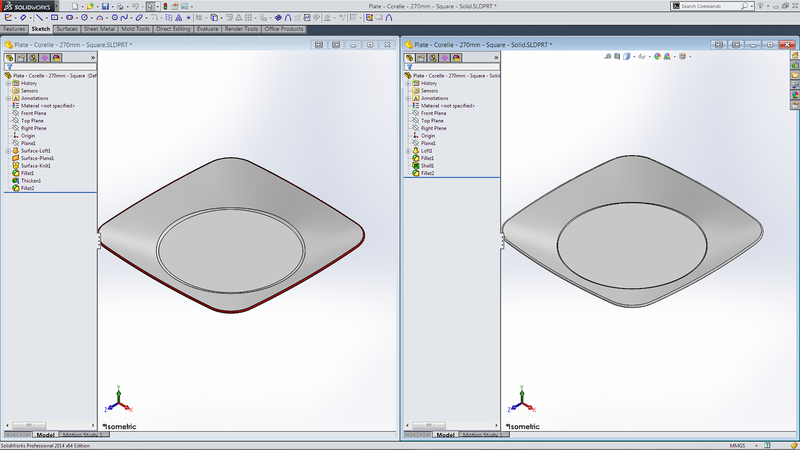 Not only did Vajrang run the files through SolidWorks 2014 he also opened, rebuilt and Saved in SolidWorks 2015 Alpha 1. So here’s a “World Exclusive” (always wanted to say that) on average the file size (seen on the disc) for most of the files was around 40 to 50% smaller than the SW2014 files! Over the past few weeks I’ve been starting to record opening times for a few of our main Assemblies. There were a few reasons for this. First we had made the decision to change anti-virus programs and I was interested to see what difference this would achieve. I also wanted to make the case for a new computer. 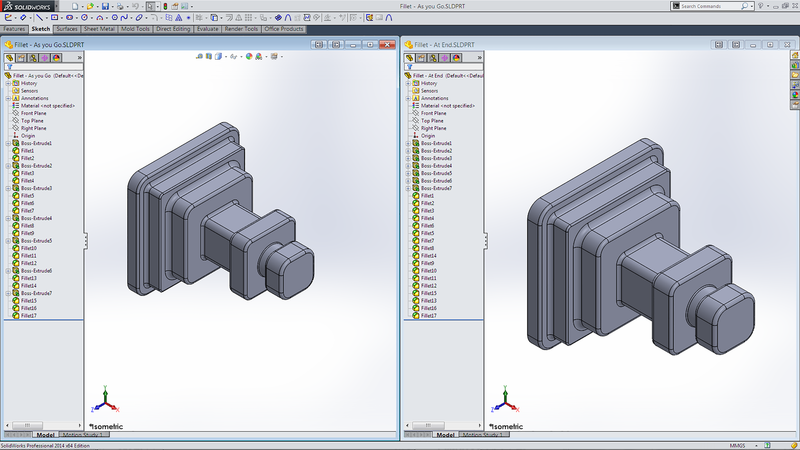 Finally I was having a few discussions about Large SolidWorks Assemblies. The outcome of this has been that we have seen a decrease of around 19% in opening times by going to a “web base” anti-virus (Webroot) I didn’t need to make the case for a new computer as I was told the other day that I should put together a specification for what we need! As for the discussions about Large Assemblies, well that has lead on to a discussion about good CAD modeling techniques and how that effect computer performance! 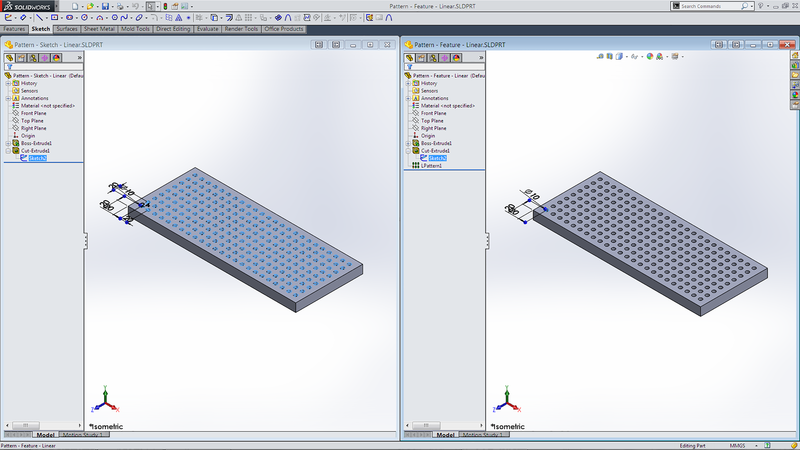 There is often talk about “Rules for good Solid Modeling” and what constitutes good CAD modeling techniques and why it is important. Much of that discussion normally revolves around preventing problems when making changes at later stages. Either with issues of “Parent-Child” relations or simply making life easier for others when they are looking to make those changes! 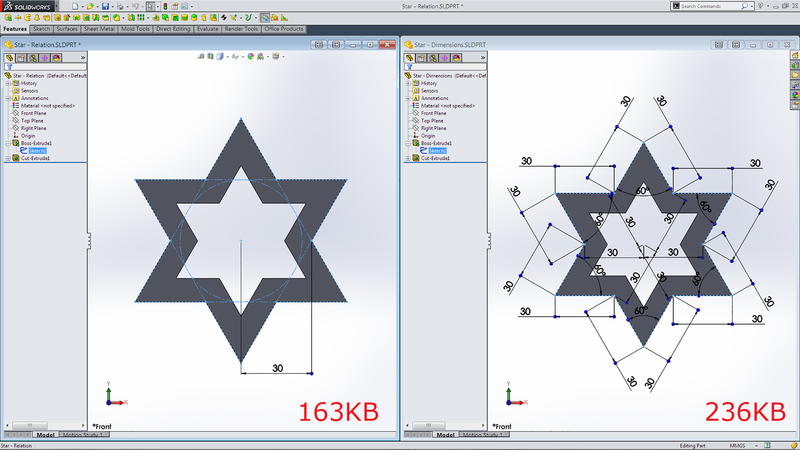 Use as many relations as you can to control the sketch over the use of dimensions. Most times this will be simpler and faster. The bonus is a much reduced file size. The following is a simple two feature part. It is better to use Features instead of Sketches. I’m certainly guilty of not doing that! 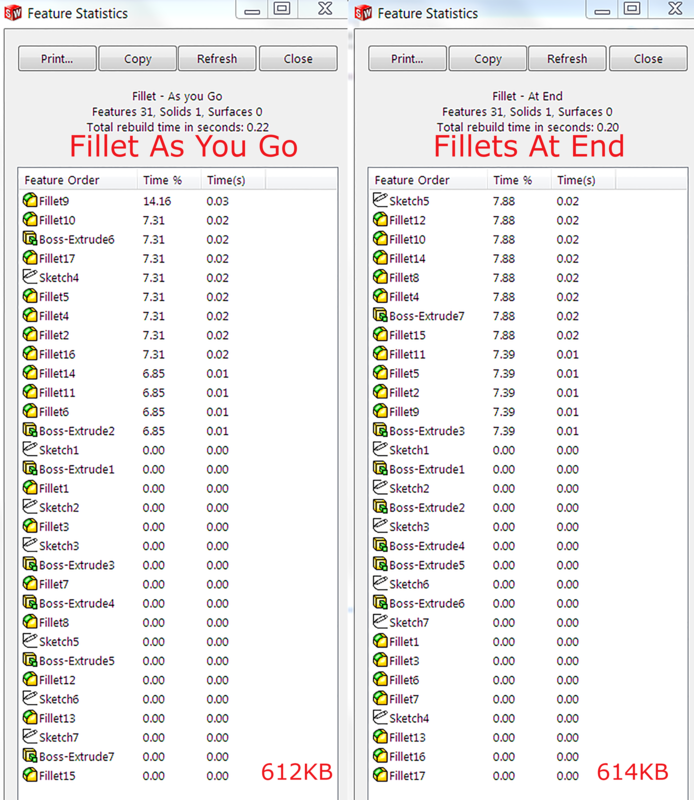 I’ve always been one to use sketch fillets. I was not aware of the effect until I had this look at them! 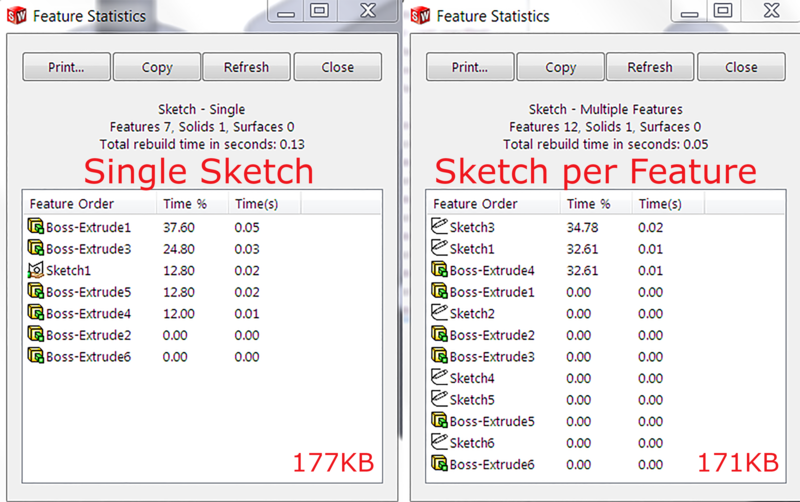 The increase in file size using sketch fillets is 84% with a 37% better Rebuild time. 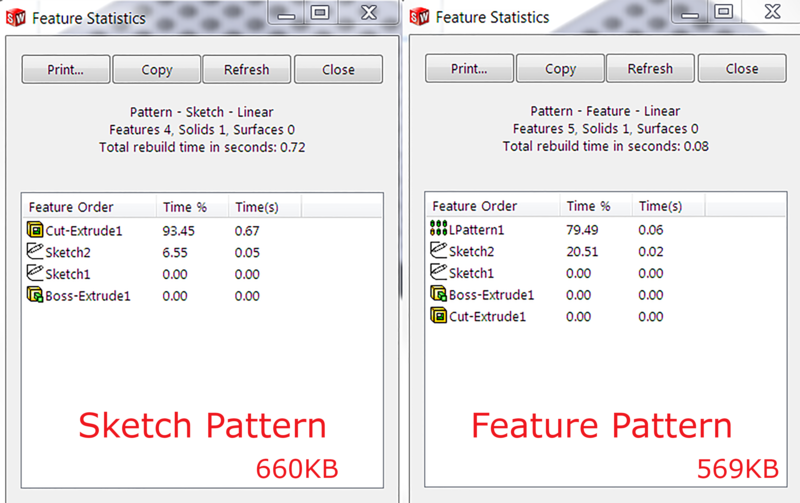 Another comparison using Sketch Pattern V Feature Patterns. I must say I can’t remember ever using (or needing to use) Sketch Patterns. This example looks to be a good reason to keep not using them. Although the increase in file size is minimal at 16%, there is a substantial increase of 800% in Rebuild time! Although there is only a small 3% increase in file size there was a substantial increase of 160% in the rebuild time! 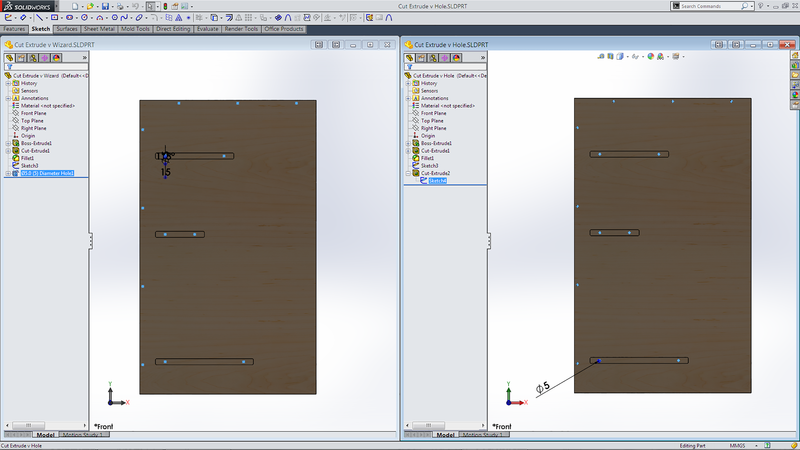 Over the years I have swung back and forth between using Cut Extrude and the Hole Wizard for the screw holes in our cabinet parts. Currently I’m back using Cut Extrude! This was an interesting results. There is not a lot in it. A small 2% increase in file size and a sizable 27% increase in rebuild time. However there is a caveat. I don’t need to produce drawing for the cabinet part. 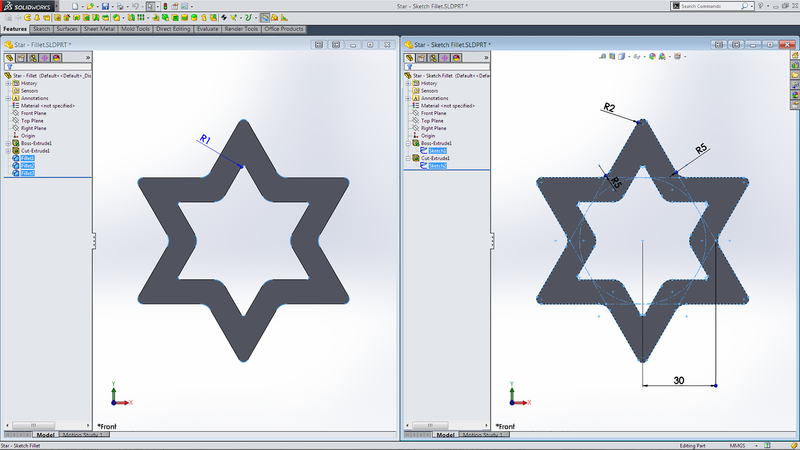 Simply export dxf for our CNC Router. 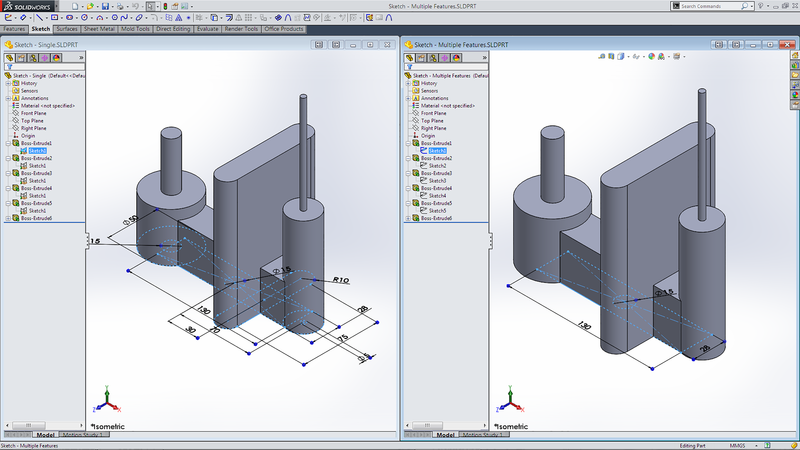 Hole Wizard allows Hole Tables and call-outs in Drawing. Right tool for for the right job! Now that I’m starting to understand Surface Features I’ve been reassessing how I produce some parts. It was a good opportunity to see what effect it may have! 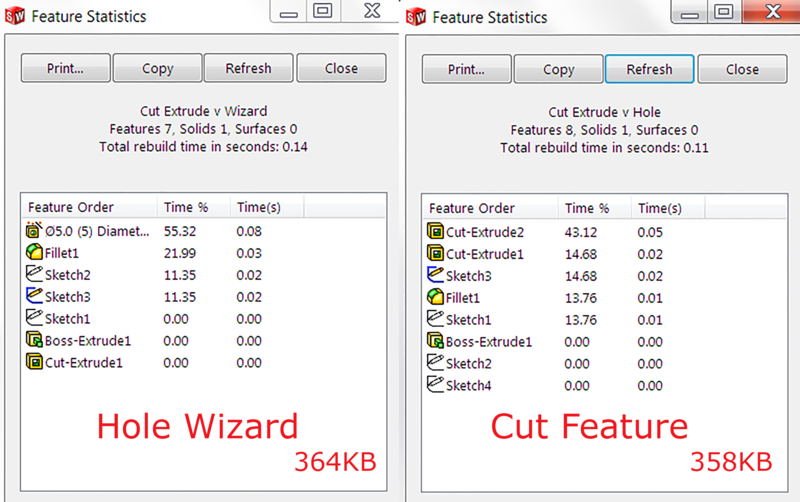 The Surface model had a very small saving of 4% in file size but a some what surprising 54% increase in rebuild time. However what was more interesting was that on both models most of the rebuild time was in a Full Round Fillet! So I had to look to see if there was an exception to every rule! Sometimes Sketches are better than Features! A sketch with a tangent arc, a revolve features will sometimes be better than a Full Round Fillet! As this simple model shows! The Extrude / Shell had an increase of 19% in file size and the Surface Revolve a 25% increase in file size. 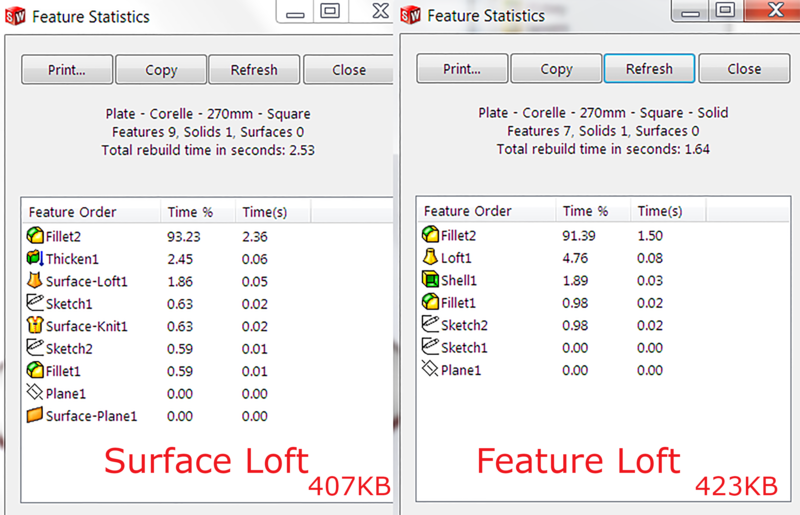 Interestingly the Surface Revolve model has a 42% Saving on the rebuild time. Whilst I’m a great believer in the “philosophy” of Colin Chapman innovating Engineer and founder of Lotus Cars who said “Rules are made ​​for the interpretation of wise men and the obedience of fools” There are at time good reasons to follow the accepted good practice!